Last Friday Samuel brought the mail up to the house and in the stack we found a few postcards. Interestingly, they were all addressed to Isaiah. As I looked more closely, I saw that each one had an encouraging message about his hard work with The Water Fight. Some also mentioned his World Water Day video. The mysterious thing is that each one was signed with only a first name and “Postcard Underground.” Of course, I immediately googled “Postcard Underground,” and could only find posts and articles written by other recipients of these kind notes. Postcard Underground seems to exist purely to encourage people – rather remarkable, if you ask me. It was fun as more arrived over the next few days. If any of you read this, thank you for your kindness to my son. It’s not always easy to be barely seventeen and have a desire to make a big difference in this world. 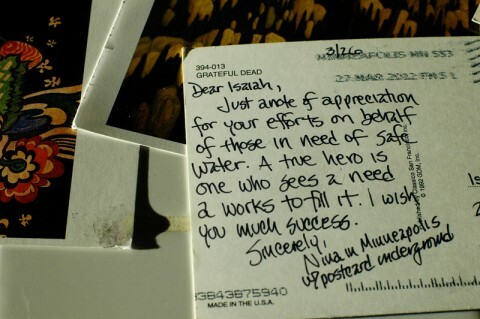 Isaiah has worked many long hours on The Water Fight, and is preparing to travel to Kenya again soon. He wants to give his life to the things that matter most to him, and you have encouraged him to press on. Words are powerful, having the ability to build up or tear down. You all know that, I’m sure, but you may not always realize the significance of the gift you give. Have you ever been the recipient of an unexpected gift or kind deed? Tell us about it. I know, Julie, it's really neat! One year when I had first moved out on my own and didn't have very much I recieved a very large Christmas package at my door. All the package said was From Jesus Love on it. It was stuff I needed for my place, but had no way to afford at the time. Ever since that year I have choosen someone that we know to leave a Jesus's love package for on Christmas morning. Tina, thanks for sharing that – what a great story. This post has made my day. Thank you for sharing and brightening my day. Words make SUCH a difference. Kudos to your son and for wanting to make a difference. I have been to some of those places in Uganda that have no fresh water and when they get the wells, it literally changes the trajectory of their lives. That story fills my eyes with tears of joy. There are many compassionate people out there in this big world. When we were first home with our adopted 7 year old daughter, many people didn't have a clue what we were going through and some shrank away when they saw the strain on our family. One LATE night when I was desperately seeking information online, I received an email from a fellow adoptive mom that I had never met. She told me that she was going to drive an hour out of her way to bring us a meal and I burst into tears. Just knowing that someone understood and wanted to love on us a little made all the difference in the world. This is so great! I'm going to send a few postcards to some friends of my kids who work hard and could use a little boost- thanks for sharing! There were several times during my childhood that we were the surprised and grateful recipients of gifts in the mail. Once it was from parents of a girl I had just started pen-palling with just as my dad lost his ability to work. Sometimes it was our church family. Several times it was cash in just the amount we desperately needed. What an amazing feeling pulling $500 from an envelope with the postmark of a big city we knew no one in. God is always orchestrating these kinds of things. My husband and I call it "Operation Barnabas" (son of encouragement). One (very stressful) year at church we wrote notes of encouragement to many members/leaders leaving the from blank and closing with an encouraging scripture…It was hard to keep a straight face when people would mention that they got a note in their church mailbox. It was fun for us, and helped us keep our focus on others instead of our own "woes". That is too neat! 🙂 And I'm glad at what your son is doing. It's not always easy, but totally worth it in the end!! At <forourgrandchildren.ca> we grandparents are gravely worried about the effect the overheating of our planet will have on our grandchildren's future. We endeavour to empower other grandparents and demand action from our governments. We speak to community and faith groups and have made two videos. A new video is being made as a result of a very successful event on May 6th, 2012 and it should be on our website soon. We had 115 people out to hear excellent speakers and discuss possible actions we can take. 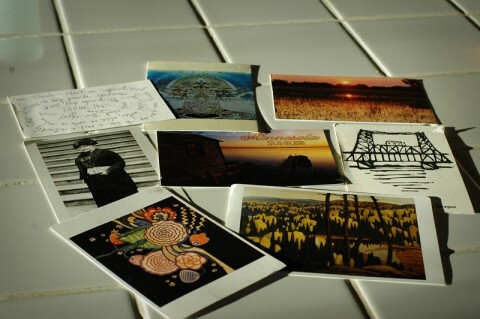 Your post card idea is brilliant. We face extremely powerful vested interests in the fossil fuel industry and its control of the Canadian government. We strongly oppose the tar sands and the proposed oil pipelines and super tanker traffic. The post card underground missives are so thoughtful, attractive and encouraging we can't thank you enough. We hope this reaches the authors.